A moat surrounds the biodigester office on Sobie Road. The sudden onset of warm weather brought with it flood conditions at Grimsby Energy’s biodigester site on Sobie Road. 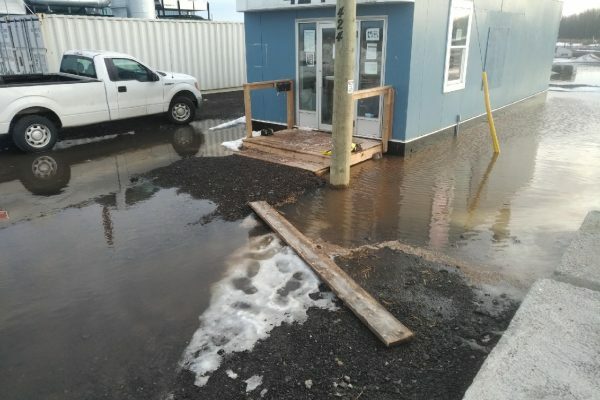 During an update to council on Monday night, GEI board chair Delight Davoli said the lack of a site plan and no proper drainage being engineered for the site has caused flooding across the grounds. She said matters were compounded by the laneway which was put in place across the drainage ditch along Sobie which never had a proper culvert built in. As a result, water is backed up magnifying the flooding problem on site. On the financial research into murky waters of the facility’s debt, Davoli said more material has turned up but a great deal is still missing. She noted the cash infusion requested from the Town will help stabilize things while efforts continue with several “tire kickers” who have shown an interest in buying the facility. “It is hard to believe that with a cost of $12 million and $15 million in liabilities how it can be worth only pennies on the dollar,” said Davoli, noting that a break-even selling price of about $12 million won’t happen.